We are having a book launch and costume party over at the Picture Book Junkie's blog this week for Janee Trasler's new book, Ghost Gets Dressed! 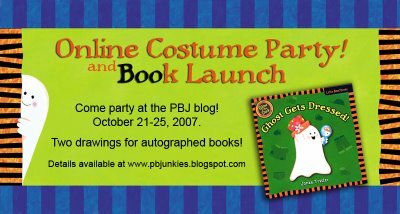 Each member of our blog has brought something to the party, whether it's a game, costume or treat to celebrate Janee's adorable new book. You can join in the fun too! Read the invitation to find out how you can win an autographed copy of one of Janee's books. Roadblocks, what is holding me back from going forward? 3. overwhelmed by my out-of-date mailing list. 1. work on cleaning up and arranging my studio - make room for illustration. 2. use the market guides to update my mailing list. 3. start by sketching 15 minutes each day. While I was camping I discovered that I love to go outside and sketch in the mornings. I feel like it's a great way to start the day. Something in your life seems overwhelming? Remember you can eat an elephant one bite at a time. Gross, okay, well you can climb a mountain one step at a time. Break down your goal into baby steps and go for it. Anyone else out there reaching for a creative dream? I'd love to hear about your story and cheer you along. I miss my humblearts blog. I've been so busy with beads, I haven't had time for anything else. As an illustrator still trying to make my way in the door, I have to find that balance between needing to work to the pay the bills and finding time to work towards the goals that I want to accomplish. 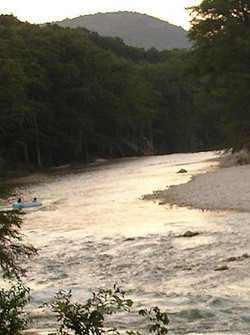 We went camping this weekend and had a rather hairy experience on the Frio Rio. It looked safe enough, but I was quickly caught in a current and completely unable to get control of where my body would go. I was swept down the river. Isn't that life? We think we are headed in one direction and suddenly circumstances take hold and we are left looking back over our shoulder at the shore wondering how we made it so far downstream without even thinking. Now as life would have it, just like on the river, eventually you'll get pushed to the side of the riverbank or a branch will come along to grab hold of or maybe it's someone with a little more foresight and a inner tube who will get you back on track. Has life swept you away? Do you see your dreams off in the distance as responsibilities and reality push you further down stream? Is that dream that you've been carrying around worth a little determination and sacrifice? Those are only questions we can answer for ourselves. For me, I need to carve out the time each day to make my way back to shore. What will it take? A set goal, a plan and babysteps until I have some real momentum of my own going. Need some inspiration this today? 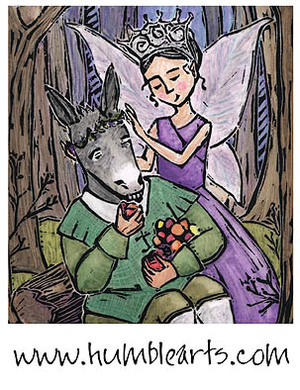 Check out the art history lesson on Women Children's Book Illustrators. Love those classical images! My critique group has started a blog with weekly themes. Go take a look and bookmark us, it's updated 6 days a week. At Barnes & Nobles tonight, I ran across A Child's Garden of Verses illustrated by Gyo Fujikawa. I was instantly transformed into a 7 year old, pouring over each illustration, wanting to be in those little worlds she created. One of my favorite books when I was little was "Oh, What a Busy Day!" 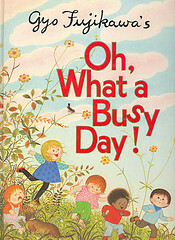 There is one image in that book: it is a rainy day, kids in a tree house, pulling a little kitty up in a basket. When I look at that image, I can feel what it's like in a summer rain, the sounds and smells, the way leaves look wet. It's just a beautiful picture. 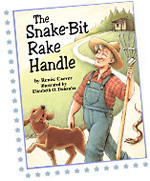 I would love to create illustrations that stayed with readers for over 25 years. Happy Mother's Day, all you crafty, creative moms! My mom's favorite children's book: Where the Wild Things Are. 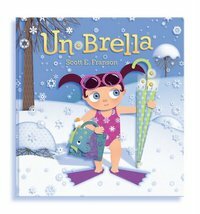 Illustrator Scott Franson's first picture book Un-Brella came out this month. The illustrations are so fresh and utterly complex, definitely the kind of pictures kids loose themselves in. I met Scott last year in L.A and love his sense of color and design. Want more un-fun? Scott's blog is full of un-book covers. Is there anything sadder than a neglected blog? I'm still around, busier than ever and blogging more than ever, just not here. I'll have to change that. Actually I need to refocus on my goals and illustrating. When the bills are due, the beads sometimes take over. But there has to be a balance between the day job and chasing after my dreams. I went to the Texas Library Association Conference yesterday to their amazing exhibit hall. It took me two hours to walk from one end to the other. Tons of publishers, the big guns with their huge booths, the smaller presses with their beautiful, well designed selections. Authors roaming about signing books. I have a million publisher's catalogs now, what a great place to do some quick market research. It was interesting to me that some of the smaller presses that I had written off based on their website, actually have quite a different selection when you see it in person. One book in particular caught my eye. 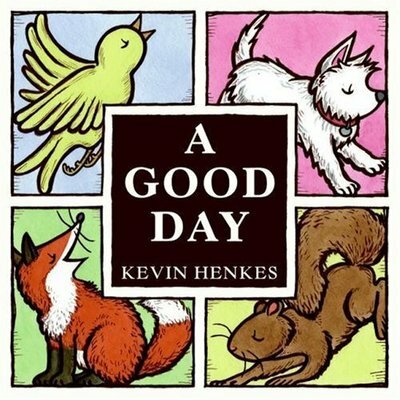 Kevin Henkes new book, The Good Day. The line work is so wonderful. You have to see it in person. Trends in children's book illustration: sketchy line work in both brown & black. Nostalgic feel to the artwork. As always, lots of watercolor but in more muted tones. Or maybe that's what I noticed because that's what I'm into at the moment. "Oh I'll make it the post office this weekend. Grr, I don't like them anymore. I have better work now. They are so boring. 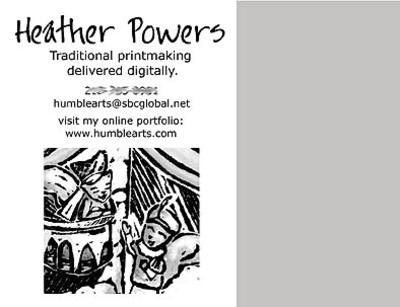 I need to print more samples and do packets instead of postcards. I need to update my mailing list. etc. etc." The excuses are endless. My goal for the rest of this year is to market consistently. Postcards every 3 months, like clockwork: March, June, September and December. Here is the latest one ready to go out the door. May I grow a green wart on the end of my nose if I don't get these in the mailbox this week. Cheer me on, I need to stay on my toes!